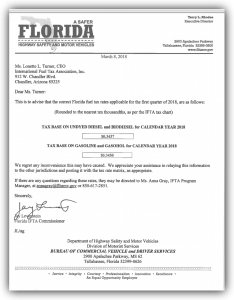 Florida made a late change to their tax rate for 1Q18. We are using the updated rate because it’s correct and it’s higher. Individual states are not required to honor late changes to tax rates, and it’s up to Florida to reconcile any over/under payments later, so watch out! Please let us know if youstumble across a state that’s not honoring the updated rate…we try to keep track of these things! Copyright 2017 by TruckEServices.com. . Designed by Platte River Design.